Don't be surprized - I've converted this blog from Doomstalker's Dev to my own development blog. I think that it'll be better to do it this way. It's a map example of what I see most of the time. Unbelievable, but few days later this unprepossessing view will become classy ocean shader. 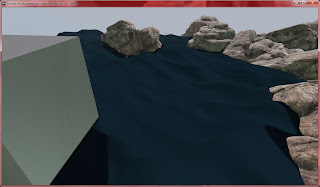 I've implemented some features considered impossible for UDK before, and the result must be really cool. So, since today I'll keep you informed about SeaCraft development process too.